It’s called Alice in Zombieland, and I love it. I’m in love with this shirt. 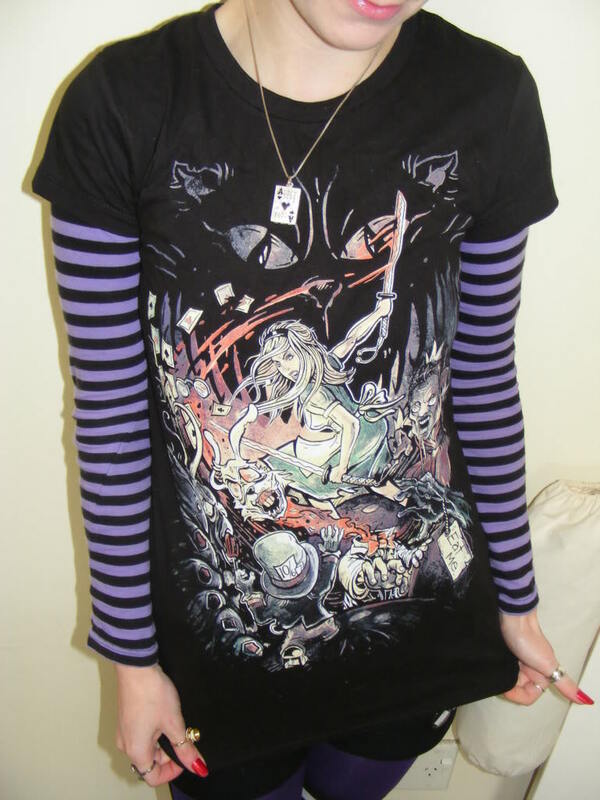 It features a demonic Cheshire Cat in the background, a beheaded White Rabbit, a zombie arm with an “eat me” tag, and zombiefied versions of the red queen and the mad hatter. I adore it. We had a very productive shopping trip today. I got a bag filled with goodies including a vintage dressing gown. Ross bought a bag of Monsters in my Pocket, which are these gruesome plastic monsters that we both remember from when we were little. I hope you guys are having a good Friday night.